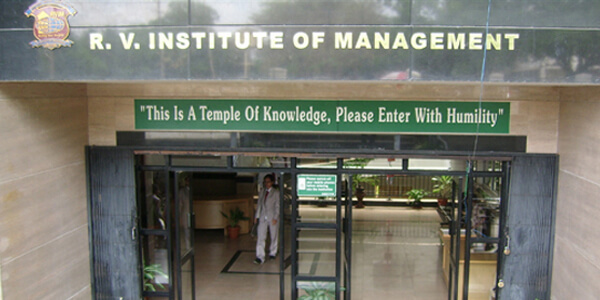 MBA in R. V. Institute of Management Bangalore is powerful business qualification that will give extra skills to make the men and women in this profession to use the world resources with higher index of productivity and intern achieving profitability keeping in view of environment concerns and green management philosophy. RVIM was started during the year 1999-2000 with a mission to impart state-of-the-art management education to our scholars with quality and value addition so that they are innovative and creative in their chosen careers. Also enables the executives from different organizations to continue their education, develop their skills, knowledge and conduct education programs for the public so as to enable them to improve the quality of their lives. It has created a research base for training, management education and consultancy. R. V. Institute of Management Bangalore infrastructure plays a very crucial role for effective learning and is strategically situated in the entry point of the software corridor of Bangalore which offers tremendous situational benefits to the students. Well-equipped classrooms, digital library, LCD Facility, two Hi-Tech Seminar halls with 120 and 180 capacity and PC lab facility with Internet connectivity. RVIM Journal of Management Research is a yearly publication from the R. V. Institute of Management, Bangalore. Its objective is to provide knowledge in functional areas of management with disciplinary approach. The views expressed in the Journal do not reflect the opinion of the Institute. RVIM Journal of Management Research is published yearly and is available against subscription. BBA, MBA, PGDM admissions are the main thing here and is done through direct asmission, management quota and nri quota. Take fee structure details online also. Graduates from any stream with a minimum of 50% aggregate marks.